It was a cold blustery day but that didn’t keep close to 200 people from turning out for the launch of The Bee Project. The event was the first in what could become an annual event over the next few years if all goes as planned by Danielle Vogler. It was held Saturday at Camp St. Croix. Vogler’s project is the first to win the Hudson Community Foundation’s SPARK grant to fund the next good idea for the Hudson area. 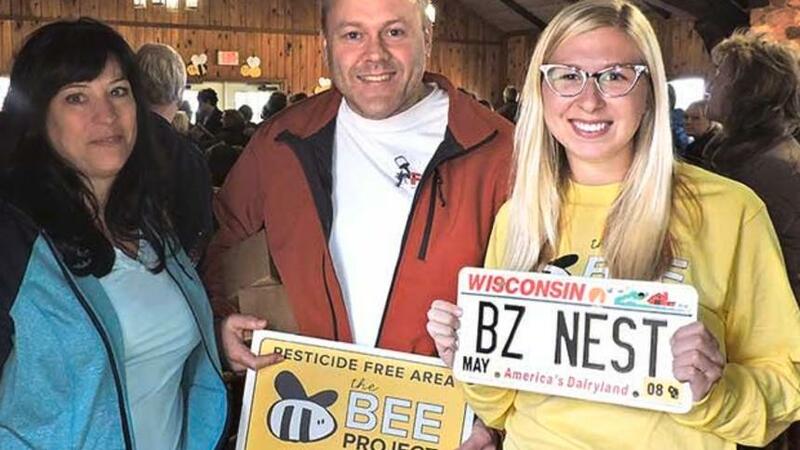 The project to increase the bee population in the area by planting wildflowers that will attract them and the valuable work they do pollinating all kinds of plants, many critical to the food chain. At the center of the project at Bee Bombs, a product manufactured in Hudson by Plantables. The company was started by the Schreibers and employs people of all abilities. Jim Schreiber was on hand and was moved by the response his company and employees, “those not often included in the workforce,” have received from the community. The bee bombs, more than 10,000 of them, contain 15 wildflower seeds in each of 50 clay balls in a box. Participants receive two boxes. The bombs are just thrown into a designated area onto soil and with water or rain will create a perfect place for bees. Schreiber said the method of planting was used by Native Americans and keeps the seed from becoming food for birds and other animals. He said the method is gaining popularity again all over the world including tomato bombs in parts of Africa. Jerome Rodewald of the St. Croix Valley Beekeepers Association explained the challenges of managing honey bee colonies. Ana Heck of the University of Minnesota Bee Squad told the audience “how bees do it” and the current status of the population in the area. All the bee bombs have been distributed for this year but they will be distributed again next spring and after that for “as long as the $20,000 grant lasts” according to Vogler. For more information go to The BEE Project Facebook page via the web address http://www.facebook.com/groups/806044556172127/.